While there is no strong evidence that chronic wasting disease (CWD) is capable of infecting humans or domestic animals, the Centers for Disease Control and Prevention (CDC) has always recommended that people discard venison harvested from known CWD-infected animals rather than continue to eat it. Research in this area is on-going, and in light of new research released in the summer of 2017, the CDC updated their recommendations regarding the testing of deer harvested in areas known to be infected with CWD. In Virginia, this includes Frederick and Shenandoah Counties. The CDC now strongly recommends that hunters harvesting deer in known CWD-affected areas have their deer tested prior to eating the meat. The CDC also recommends that wrapped venison butchered from individual deer be uniquely marked on the outside of the package so that if a deer tests positive, venison from that particular animal can be identified and removed from a freezer. It is important to note that the currently available CWD diagnostic tests are not food safety tests and the intent of any testing is not to certify a deer as “safe for consumption”. Test results will be either “positive” or “no prions detected”. In the early stages of infection, prions may not be at levels detectable by the test. 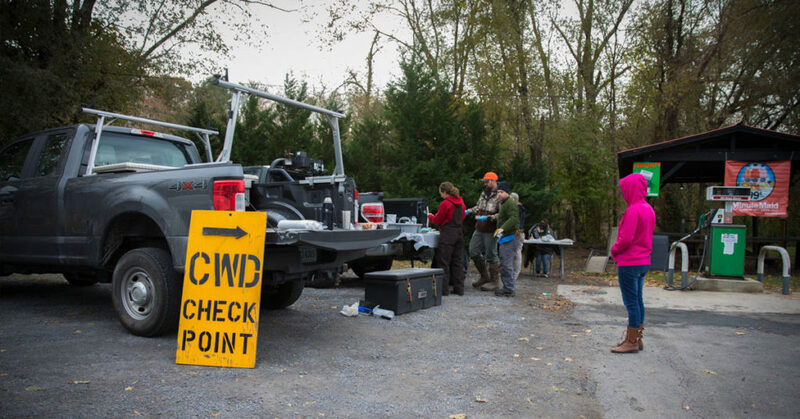 A negative test result does not guarantee that an individual animal is not infected with CWD, but it does make it considerably less likely and may reduce risk of exposure to CWD.